The review panel is chaired by former Cuban President Raul Castro, who remains the First Secretary of the Central Committee. 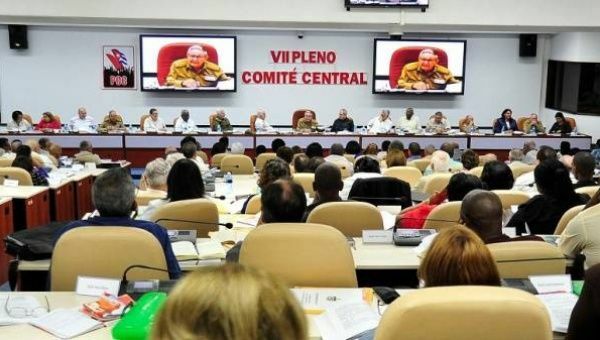 July 4 (teleSUR) Cuba’s 7th Plenary Session of the Central Committee of the Communist Party of Cuba, or PCC, is reviewing the constitutional draft during a two-meeting, which aims to introduce reforms into the country’s Magna Carta. The review panel is chaired by former Cuban President Raul Castro, who remains the First Secretary of the Central Committee of the PCC, and includes the country’s new president Miguel Diaz-Canel, the second secretary of the PCC, Jose Ramon Machado Ventura and others. He explained that although the draft contains significant changes to the current constitution, it will retain the fundamental precepts of the island’s political and social system based on socialism. The panel pointed out the political significance of the ongoing review process, as well as the importance of the work undertaken by the 33 members of the commission. He also noted that the current constitution has been in force since 1976 and that proposed reforms are intended to respond to historical circumstances that have changed over time, according to Prensa Latina.